It is with great sadness that club advises that Julie Walsh ( mother of Lisa Wiz ) has passed away. Julie was one of the original East Keilor FC Committee who did many jobs around the club in our formative years and served right through until the 1990’s. She served in many roles during her time at the club and in 1997 was inducted as the 3rd officially recognised Club Legend . Julie will be missed by many of the older supporters and players who will remember her as someone who was always there to lend a hand and to make the EKFC a better place. Our condolences to the Walsh family during this sad time. To all Senior, Reserve and Under 19 Players. Open age players meeting WED NOV 7 at 7.00PM . Please note: There will be a meet the coach / information night about Season 2019 . It is a great opportunity for everyone to meet Senior Coach Pat Christofi and his team who will outline their plans for Pre Christmas training/ Pre Season training and the full Season of 2019. Pat has already shown great commitment and enthusiasm to the task ahead and we have no doubt he will be a great asset to the Cougars going forward. We wish to advise that the Annual General Meeting of the East Keilor Football Club will be held on Monday the 15th of October at the Clubrooms, Overland Reserve, Parkside Avenue, East Keilor, commencing at 7.00 pm sharp. Nomination forms are attached and may be filled out and returned to Geoff Nicholl prior to the meeting, otherwise all nominations will close at 7pm on the night. Your copy of The Footballer comes free with entry into the venue. Please note that due to recent incidents, the EDFL has decided that no animals will be permitted into any finals venues, except for dogs to assist people whose vision is impaired. With the end of the junior season rapidly approaching, we look forward to any interested parties making contact. Can teams please make sure they arrive a half hour before their posted time and wait in the change rooms. Your Team managers will give you more details. Come down to watch the Seniors, and enjoy some FREE face painting and a jumping castle! East Keilor FC is proud to have the Kealba Hotel on board as one of our Premium Sponsors in 2018. The Kealba Hotel is a well known land mark in the western suburbs and manager Tony Furnari ( who has connections to the Cougars ) has kindly agreed to support our club. The senior jumper presentation was recently held at the Kealba and it really is an impressive complex. We will shortly have some meal vouchers available for sale at the club with the proceeds raised from the sale of these staying with the club. So please support this initiative. We thank Tony and the Kealba for their support, so please get along to the Kealba when you can! East Keilor FC will be holding a FREE Auskick Clinic on Saturday April 14th at 10am – We invite anyone interested to attend, and registrations can be made on the day. The Uniform Shop will be open next Wednesday March 21 & Friday March 23 for orders, try-on’s and payments – no sales will be made on these dates, as all stock will be ordered in. Once received by the club, Merchandise will be passed onto Team Managers to distribute to their teams. *NOTE: THIS IS THE ONLY DATE THE SHOP WILL BE OPEN AT THIS STAGE. If you are unable to make these dates, please get an order form from the Team Manager, otherwise they are available to print via the Website and Team App. If paying by transfer, please use your surname and merchandise as reference. The season is fast approaching and this will be your ONLY CHANCE to order any shorts, socks, jumpers in order for them to arrive before the season commences. If you have any issues, please contact your Team Manager or Lisa Wiz. For those who are doing it for your Team or Club this will mean ERC will no longer be needed as Sports Trainer is a high qualification. If you are interested, please message us via Facebook or email alana.hill@live.com.au ASAP to confirm your spot and we can forward payment details to be made to the club. will be part of a great team, learning new skills and playing non-contact AFL games. To reiterate, attendance at the above mentioned course will not get coaches their Foundation Level Accreditation. In order to gain this accreditation, coaches will need to complete the relevant online course, with further details of this to follow in the coming weeks once confirmed by the EDFL. 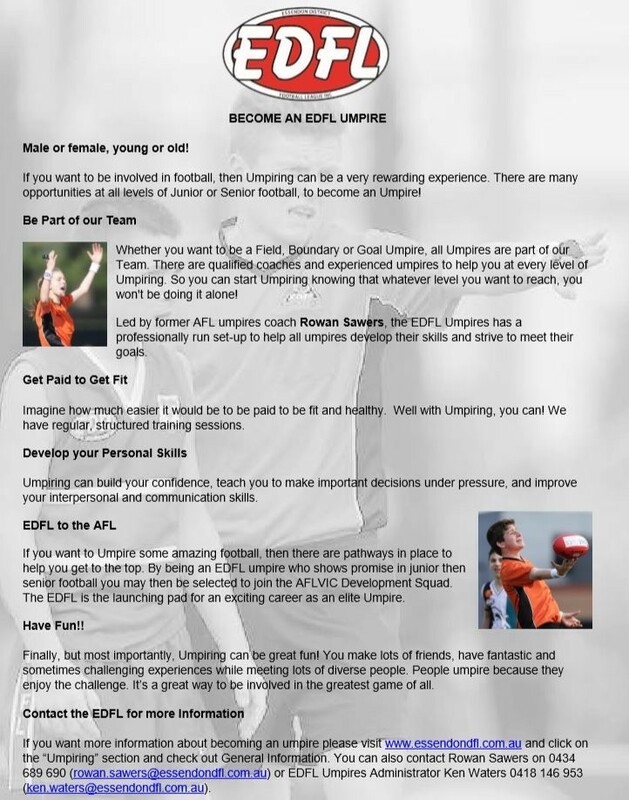 The EDFL are looking for Umpires for the upcoming 2018 season – It’s a great way to get involved with the community and stay fit, whilst being paid.